This past spring community members began helping the Akron-Canton Regional Foodbank increase its distribution of fresh produce to food insecure individuals by participating in Plant a Row for the Hungry. The Plant a Row for the Hungry program encourages gardeners to plant an extra row in their gardens and pledge to donate that food to the Foodbank. 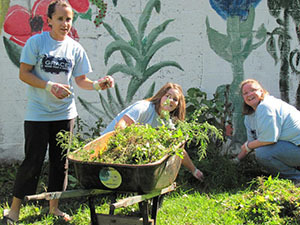 The program is rooted in the heartfelt tradition of gardeners sharing a bountiful harvest with others. Last year, Plant a Row for the Hungry provided enough pounds of produce for 11,555 meals. “Our goal is to ensure no one in our community goes hungry, but ultimately, we want them to have access to the most nutritious food possible,” said Dan Flowers, President and CEO of the Akron-Canton Regional Foodbank.